On Tuesday the 16th of April, trading on the euro closed down. The EURUSD pair was knocked off its perch of 1.1314 by Reuters, which reported that ECB policymakers doubt the bank’s projected economic growth figures for the second half of 2019, saying that they’re too optimistic. 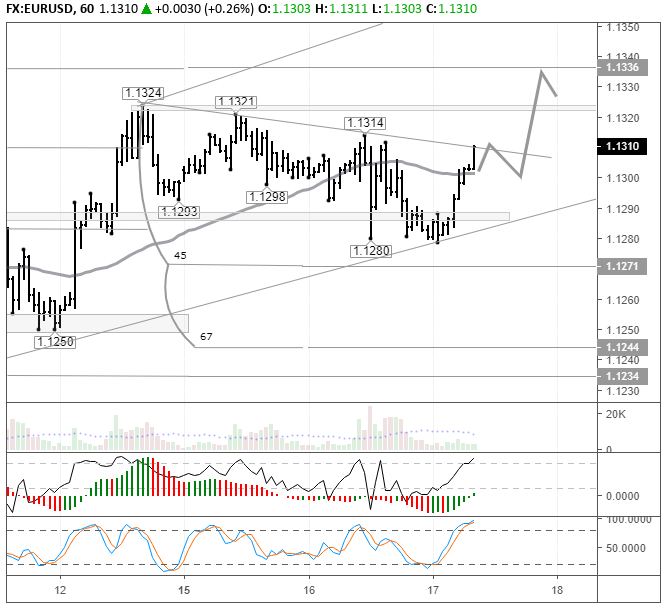 Within two hours, the pair had returned to the 1.1314 resistance, but failed to remain there. Trading on the euro closed in the lower half of the intraday range. 11:00 Eurozone: current account (Feb). 12:00 Eurozone: CPI (Mar), trade balance (Feb). 15:30 Canada: CPI (Mar), imports (Feb), exports (Feb). 15:30 US: trade balance (Feb). 16:00 UK: BoE Governor Carney’s speech. 17:30 US: EIA crude oil stocks change (12 Apr). 17:30 Eurozone: ECB’s Lautenschläger speech. 19:45 US: Fed’s Bullard speech. 21:00 US: Fed’s Beige Book. Headlines in the media caused some fluctuations yesterday, but it’s clear that they did little to change market sentiment as a whole. The EURUSD pair has again returned to 1.1314 on the back of strong Chinese GDP and industrial production data. After a short period of consolidation, I expect this morning’s rally to continue to the 90th degree at 1.1336. Look at the pair’s movements from the 10th to 12th of April. The market is currently behaving in a similar way. With the Easter holidays approaching, along with the long weekend, trader and investor activity is set to decline. Many traders will close their positions ahead of the long weekend, which will likely lead to high market volatility.